The characteristics of a radio channel can strongly impair signal transmission between a transmitter and in particular a moving receiver. The Baseband Fading Simulator R&S®ABFS generates signals that simulate real receive conditions in mobile applications. The characteristics of a radio channel can strongly impair signal transmission between a transmitter and in particular a moving receiver. The Baseband Fading Simulator R&S®ABFS generates signals that simulate real receive conditions in mobile applications. Thus, the response of receivers under real-world conditions can already be checked during development and QM acceptance testing. The simulation of fading signals at baseband level reduces costs. Conventional fading simulators normally convert the signal of the radio channel to the IF, perform fading and then reconvert the signal to its RF frequency. It is, however, less costly to loop in the simulator prior to the fi rst conversion to the carrier frequency, i.e. to simulate at baseband level (I and Q) and then convert to the correct frequency in the test system (see Fig. 3). Signals will therefore not be impaired by the effects of multiple conversion. This baseband fading simulation makes upgrading to new networks or standards easy. The flexible concept of the R&S®ABFS allows the simulation of radio channels of existing and future communications systems (e.g. mobile radio, broadcasting, flight telephone, WLL, or WLAN systems). The R&S®ABFS can also simulate frequency hopping systems. 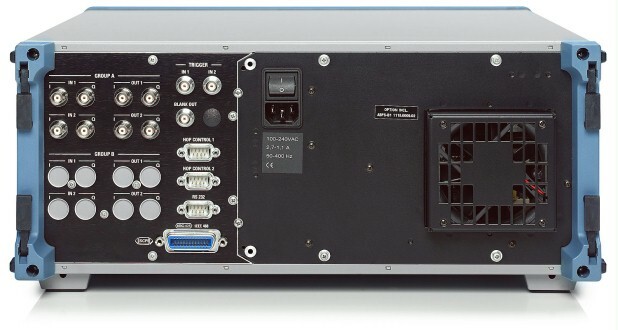 The R&S®ABFS is fast enough to follow the frequency hopping of a test system, for example within a frame of 4.616 ms (GSM frame time). Furthermore, an offset voltage for each I and Q input or output can be entered to compensate for external DC offset voltages. Together with a baseband source (e.g. 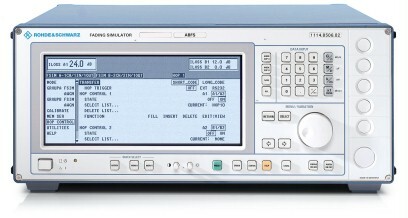 the I/Q Modulation Generator R&S®AMIQ, see Fig. 1), receiver tests can be performed at the I/Q level even if the corresponding RF link is not available. During the development of receivers or correction circuits in the receiver (e.g. equalizer), the effects of fading can thus be checked at a very early stage. The Baseband Fading Simulator R&S®ABFS is suitable for universal mobile radio applications in research, development and production. It comprises all scenarios and statistical models for simulating sporadic fading as specified in the test regulations of mobile radio standards (e.g. GSM, 3GPP WCDMA or R&S®CDMA2000). Distribution of an input to two outputs (e.g. with different fading profiles). This feature makes it possible to simulate the signal of two antennas with different characteristics or frequency diversity methods. Simulation of two channels with individual profiles and addition at the output. Cell change or superposition of interferers can be tested with this configuration. The Noise Generator R&S® ABFS-B1 adds a noise source to the output of the fi rst channel (see Fig. 4) so that noise can be simulated in the frequency band used. The noise generator can be switched on or off irrespective of the operating modes of the basic version. The optional Second Fading Simulator R&S® ABFS-B2 offers two extra channels with the same characteristics in addition to the two channels of the basic model. The optional Second Noise Generator R&S® ABFS-B3 provides an additional noise source for a further output. This second noise generator is either assigned to the second channel of the basic R&S® ABFS (with the first Noise Generator R&S® ABFS-B1 for the first channel) or to the first channel of the Second Fading Simulator R&S® ABFS-B2. Many fading models have already been programmed in ABFS. The user can quickly recall these default settings and also modify the parameters. In fine delay mode, the fading simulator resolution is increased to 1 ns with up to four paths being available. In moving delay mode, two paths are simulated: the delay for one path remains constant, whereas the delay for the other path varies continuously. In birth/death mode, there are two paths where the delay changes in steps in accordance with the 3GPP channel model. The option R&S® ABFS-B50 enables the enhanced fading functions for 3GPP WCDMA for the second fading simulator.